How can I reuse or recycle novelty jester hats? | How can I recycle this? How can I reuse or recycle novelty jester hats? 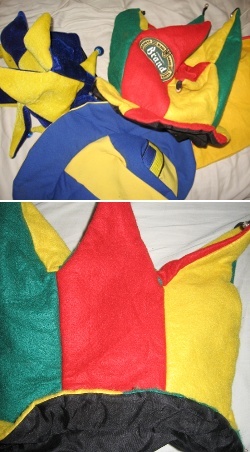 When cleaning up I came across a lot of jester hats from my boyfriend (about two dozen). He has collected them over the years for free at carnival (we are from Holland). Giving them away hasn’t been succesful, and we don’t have freecycle nearby. So I was wondering if we could reuse them in some way. They are made of different kinds of fabric, some I can’t place (and there is nothing on the labels). Some are felted and some are fake velour I think. Two dozen jester hats! That’s quite a collection! I really hope he knows to reduce from now on and not collect any more. As for reuses, the felted ones may lend themselves to small felt craft projects – there are lots of felt brooches around these days and basic (but pretty) ones are quite easy to make (for example, these butterflies ones). As for the velour ones, I have half a memory of seeing a cushion made out of novelty hats but no amount of Googling will confirm I didn’t just make that up in a cheese dream. what about making a string of decorative pennants, like the kind for birthdays? (the upside down triangle) if you open up the hats and string them side by side, you could have a very festive reusable party decorations! gREAT IDEA ON THE PARTY PENNANTS! Also consider local theatre groups either community or college or high school. I work with a group and we would give quite a sigh of delight should such a stash be donated. -The hats themselves would make a creative sort of gift wrap, providing the bottom could be covered. It then becomes part of the gift, especially fun for kids. – Would a costume store be interested, or a school or group that teaches clowning? Around here, some members of the Masons, especially Shriners are often clowns. -How about a drama group, especially in a school, especially one that does medieval work- some shakespeare plays may have use for it. -I can see it now as part of a flash mob. Would make a nice cover for a flower pot. This is a little funny. Very cute. Could any of them be converted to a tea cozy? It might make a fun gift in that form! I just came across a cool way to upcycle your old bikinis. I didn’t see anything like it on this site, maybe you can repost it for female readers? Check it out! How about making small purses. Put a zipper across the opening and add a strap.